Admittedly, @hipsterrunoff have been a little MAINSTREAM lately, but all may be forgiven after this sensible statement regarding the burgeoning dinowave scene. When Wim Wenders announces his adaptation of The Land Before Time, you'll know why. 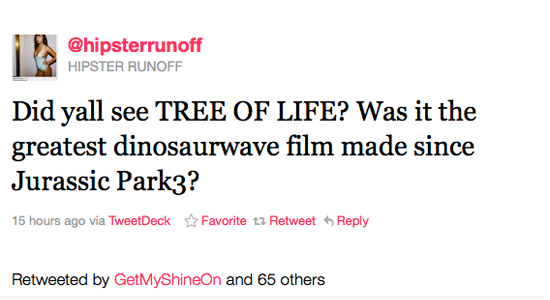 And there, friends, is the most solid argument to seeing THE TREE OF LIFE this summer. No offense to Mr. Bay, but sometimes mind-explosions are more gratifying than just regular explosions (also, Robotech just started streaming on Netflix, if you're into seeing giant robots beat each other up). Again, with the dinosaurs! 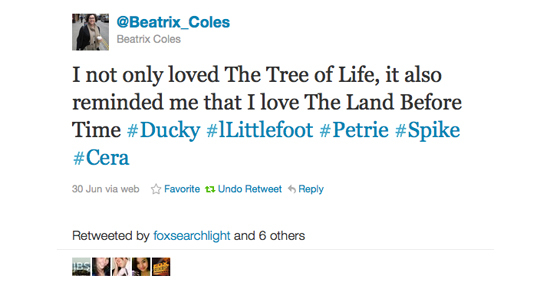 Although @Beatrix_Coles' tweet did bring us back to a by-gone era called "the '80s", and the set of The Land Before Time plastic Burger King toys we coveted with joy. Those ruled. 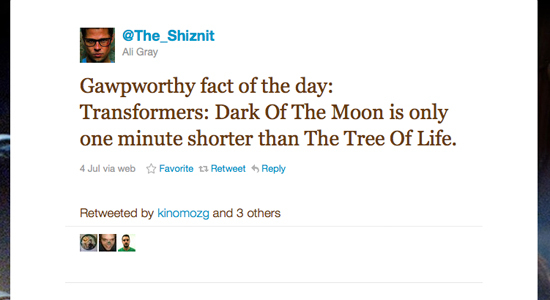 No better excuse to go to the movies, @SidneyWeich. Our a/c broke down this weekend and had we been able to peel our exhausted carcasses off the couch and out of the direct windfall of our floor fan, we would have gone straight to the multiplex. Harsh? Maybe. Totally understandable? Of course! We've already started calibrating all our of personal relationships of reactions to THE TREE OF LIFE, if only for our own sanity and mental well-being. Have something to tweet at us? We live @foxsearchlight. Come on over and say hi.